The patience of ‘YUUTEs’ The Troika has “left the country”, our economic sovereignty has been restored and most recently Forbes magazine declared the ROI the best country in the world to do business. What’s that then about the Troika popping back every six months for the next decade or so to see our books? Austerity is far from finished and youths in particular are paying the brunt. So far, they’ve been very patient. CSO figures from counties Wexford, Limerick and Donegal show that youth unemployment reaches 70% in some rural areas and small towns (the national rate is 30%). It’s a largely unrecognised phenomena. In County Wexford, Taghmon’s youth unemployment rate soared to 70.4%, Bunclody hit 67% and Enniscorthy town’s rate reached 62.4%. borrow the ‘Yuute’ term for his next book. **** The independently-produced Mid-Term Review of the Local and Community Development Programme has been published. It will guide the design of the LCDP’s successor programme, due to be in place for mid-2014. In this edition, we give more space than normal to reflection, research findings and views on the ground. Everyone in the community sector is in that space now, wondering what comes next, how to put a shape on it, what are the unsaid things that may be driving change and so on. It’s important for balanced development to heighten our focus on equality, human rights (and responsibilities), community development and environmentally sustainable development. **** Finally, a word of congratulations to fisherman and community activist Pat O’Donnell from Erris on his recent bravery award from the State. Well deserved. Postal address: ‘Changing Ireland’, c/o Community Enterprise Centre, Moyross, Limerick. Packing and Distribution: Speedpak, Dublin, an award-winning social enterprise. Printed by: Davis Printers, Limerick. Tel Editor: 061-458011. Tel Admin (Mon-Wed): 061-458090. Voluntary Board of Directors: Ali Rabiya, Kay Flanagan, Viv Sadd, Ellen Duffy and Gearoid Fitzgibbon (chair). ‘Changing Ireland’ thanks everyone involved in the production of Issue 44. FILE A REPORT FOR US! If you enjoy writing, why not file your own report for us. 300-400 words is plenty (and a photo if possible). Well over a hundred community workers and volunteers have done so over the years. The chief criteria - you must be involved as a volunteer, worker or board member with a LCDP-funded project (check our website). Alternatively, tell us something novel about your community that others could learn from. Contact details above. Local Development Companies should be paying close attention to the Government’s plans to implement the European Youth Guarantee Scheme as the end of the year approaches. The Guarantee is the ‘big idea’ agreed by EU leaders earlier this year to tackle the youth unemployment crisis in the Union. Under the scheme, every young jobseeker aged under 25 will be offered a good quality employment, training or educational opportunity within four months of becoming unemployed. Extra funding is available from Europe for those countries, including Ireland, with particularly high rates of youth unemployment. Currently, the Irish Government prepare an implementation plan for submission to Europe. collaboration! Wexford Local Development is expert at community work while ‘Changing Ireland’ has delivered tailored media training to community groups since 2001. Recently, WLD approached us on the subject of unemployed youths: a novel collaborative approach to producing journalism evolved. WLD booked a premises and arranged transport from across the county and ‘Changing Ireland’ delivered a half-day media skills training to members of the Youth Action Project. They interviewed each other and produced write-ups. Stephen Doyle went to Enniscorthy and produced his first piece of journalism. As they outline here, they want a say in shaping Ireland’s Youth Guarantee. In early December, the group visited the Dail to get their message across. people’s voices to be heard and listened to as responses are shaped. Finland has also highlighted the importance of agencies working together on the ground to address the needs of young people in their particular location. play a pivotal role in the implementation of the Youth Guarantee in Ireland. Why? 1. LDCs are good at bringing stakeholders together to address the complex needs and barriers faced by our target groups. Introducing a Youth Guarantee will pose a challenge to all service providers and will demand a cooperative, creative and focused effort at local level. 2. LDCs know their areas inside out, work closely with local employers, agencies and community groups and have built up relationships of trust with the young unemployed people we work with through the LCDP, the Local Employment Service (LES) and the Tús programme. We are very well placed to broker the most appropriate ‘opportunity’ for each young person coming onto the Youth Guarantee Scheme. Scheme in Enniscorthy (see article below) can provide essential work-focused opportunities to keep young people close to the world of work while actual job creation remains low. 4. 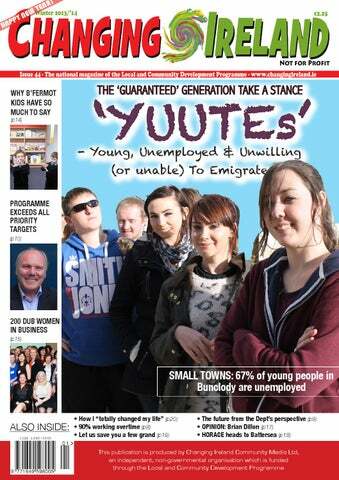 Youth Guarantee schemes, while a welcome development, are by no means a ‘cure all’ for youth unemployment. Evaluations of schemes in Sweden and Finland have found that more qualified young people who are new to the jobs market get much more from a Youth Guarantee than the most marginalised young jobseekers many of whom are already long-term unemployed. LDCs can take a lead role in developing specific interventions to ensure that these ‘at risk’ young jobseekers are not left behind by a blanket Guarantee scheme. Guaranteeing ‘a good quality opportunity’ to all young jobseekers will be a major challenge, requiring flexible and personalised approaches which take account of each local situation. As plans take shape for the successor programme to the LCDP and alignment moves on apace, shouldn’t we be talking about this? Siobhan O’Brien is WLD’s policy, evaluation and monitoring officer. The Youth Guarantee is a new approach to tackling youth unemployment which ensures that all young people under 25 – whether registered with employment services or not – get a good-quality, concrete offer within 4 months of them leaving formal education or becoming unemployed. The offer should be for a job, apprenticeship, traineeship, or continued education and the offer should be adapted to each individual need and situation. Every EU country endorsed the principle of the Youth Guarantee and must now submit a Youth Guarantee Implementation Plan setting out how the scheme will function. European Commissioner for Employment, Social Affairs and Inclusion László Andor said, “This will ensure that no young person is left without hope or opportunity.” Member States eligible for additional funding must submit Youth Guarantee Implementation Plans before the end of this year. That includes Ireland because it has a youth unemployment rate well over 25%. In some towns, it is close to 70% and is highest in counties Limerick, Donegal and Wexford. The new scheme is due for launch in 2014. A Youth Guarantee scheme is currently being piloted in Ballymun, Dublin. Youth Action Project member, Andrew Hartnett from Enniscorthy, has questions about the Guarantee for Minister Howlin. Andrew supports the Pathways To Work initiative which is tied in with the Youth Guarantee. “Both initiatives have potential, but they’re mainly targeted at over-18s. I want to know what will the Minister change at secondary school level to prepare people in school for these initiatives? Not everyone wants to go to college,” said Andrew. - Youth Action Project members speak up for thousands in Wexford BY ALLEN MEAGHER The public should get over seeing young unemployed people as lazy because they’re not and the Government should redesign elements of the Youth Guarantee scheme before it’s launched next year. The secondary school system and the scarcity of courses also need attention. That’s according to members of the Youth Action Project, comprised of unemployed young people in County Wexford. In interviews conducted in Wexford town in October on the very day the State proclaimed that the country had escaped the Troika’s grip, a dozen of the approximately 3,000 youths who are unemployed in the county spoke up. to be people who don’t actually want to do anything and I don’t think that should be an option. I don’t know how they work out who wants a course and who doesn’t, but they should be cut if they don’t want to work. “There should also be more courses and more variety. FAS doesn’t have enough computer courses and it should run courses people want to do too, for example, in photography.” “There should be a grant scheme for people starting small businesses,” added Vivien, unaware that one exists. Frustrated at the lack of information on jobs, courses and initiatives, she wants young people nationwide to “organise groups in their communities” and draft up lists of jobs and to share knowledge and learn skills together. Young people are up against it, as 21-year-old Ethan Molloy’s story shows. Martina Ryan interviewed him: “ “Ethan sent out 80-90 CVs this year, 70-80 CVs last year and even more the year he left school. Printed CVs, not emailed ones… He personally went around Enniscorthy handing them into local businesses. “He couldn’t even get a part-time job washing dishes (no experience),” said Martina. Ultimately, Ethan wants to become a social worker and he’s received advice from Access 2000 on entering third level as a mature student. Lucy Daverne (17) from Wexford town wants to see changes to the secondary school system: “There are eight different ways to learn. I could learn visually, you could learn through music, but if you’re not a standard learner, you don’t learn and you might get kicked out of school for misbehaving. She was aware of alternatives including Youthreach and the Leaving Cert Applied. “Yes, but your confidence gets knocked. I’ve a friend who wanted to be a solicitor and now doesn’t want to be anything.” Lucy called for the teachertraining colleges to revisit their own lesson plans. Youth Action Project members in Co. Wexford. Photo: Changing Ireland. Stephen Doyle. Photo: Changing Ireland. Joe Redmond is currently on Tús placement at the 1798 visitor centre and said he has gained huge confidence and his interpersonal skills have greatly improved. He previously completed a course in barwork and worked in Supervalu before becoming unemployed. Would he recommend the Tús experience to others? “If anyone young and unemployed out there has low self-confidence, this course is great. I would definitely recommend this course.” From the outset, Joe saw that confidence was very low among his peers: “They were so shook by their experiences on the dole… but as the weeks went on they came out of their shells.” Joe’s ambition is to become a social worker. Joe Redmond took up a Tús placement at the 1798 Centre and the Castle Museum. Photo: Abigail Ryan. Grainné Roche would like to work as a mid-wife and is presently, through Tús, working in St. John’s Hospital, Enniscorthy. “I like that I’m not in a dole queue being looked down upon by old people,” she said. She appreciates the guidance she is receiving at work. Grainne Roche and Hayley Carroll are on placement in St. John’s Hospital, Enniscorthy. Since May, 20 young unemployed people have been taking part in a pilot project initiated by Wexford Local Development (WLD) to address the youth unemployment crisis in Enniscorthy. WLD went to the Department of Social Protection early this year and sought a list of under 25-year-olds from Enniscorthy to invite for interview for a place on a dedicated Tús scheme. Drawing on the experience of the ‘Team Programme’ in the UK which is run by the Prince’s Trust, WLD’s LCDP and Tús staff created a new project based on training, work placement, teamwork and community involvement. The young people who were successful in getting onto the programme took part in a six-week introductory training course funded by the LCDP. This course introduced them to community development, local heritage, tourism, IT and skills for healthy living. Gary Miller couldn’t have been placed in a more ideal workplace. Photo: Abigail Ryan. LCDP Goal 2 seeks to increase access to formal and informal educational, recreational and cultural activities and resources. That includes youthwork. Under this goal, the programme “engaged” with 84,722 children and young people in 2012 (a figure that “is well on the way to doubling the 2012 target number of 49,439”). It’s also a decent increase on the 65,614 young people reached by the programme in 2011, as noted in the programme’s recently published Mid-Term Review. However, this aspect of the companies’ work is “extremely variable”, the report states. “There is little or no provision in some (LDCs) and even where provision is made there are no examples that merit the description of ‘high priority’. Pobal acknowledges that there is a problem in this regard.” Action was taken to promote mental health by 9 LDCs, to provide youth training (4 LDCs) and to support “personal, social and cultural development” (35 LDCs), to take three examples. The quality and details of LCDP work in relation to young people was not available. The review quotes from Pobal research which found that, despite high levels of engagement in places, most LDCs prefer to leave it to schools, youth work providers and parents groups. The report recommends that “appropriate relationships need to be established at a national level with the new Child and Family Support Agency and the Department of Children and Youth Affairs.” And what is youth work? the terms “youth work”, “youth provision” and “work with young people” are used interchangeably. Youth policy in Ireland states that the age range for young people is 10 to 24. “The programme usually engages with the older group for education or employment purposes as opposed to youth work,” noted the Mid-Term Review. It advises: “As the companies respond to the Government’s emerging priorities, they might pay particular attention to encouraging attempts to involve young people as active citizens in relation to democratic renewal.” The report recommends that the Programme specifies the age group to be targeted, defines youth work, is clear about what work should be conducted and measures the outcomes not by numbers, but qualitatively. It would be useful to provide guidance to providers on the age range of clients they should engage with, and a definition of youth provision that is consistent with youth policy, while also setting clear parameters about the work that is required under this programme. - Survey finds staff concerned over future of community education CAMILLA FITZSIMONS REPORTS* Research being undertaken among community educators has found that over 90% of 222 surveyed work more hours than they are paid for. Of these, over 120 work within the community sector employed by Local Development Companies, Family Resource Centres, addiction support projects and independent CDPs and community education centres. The finding probably doesn’t surprise those of us working in community education and demonstrates the commitment of tutors despite often uncertain employment conditions. ‘MIXED FEELINGS’ OVER NEW AWARDS The research also found that many having mixed feelings about the use of FETAC (Further Education & Training Awards, now QQI - see below) in a community setting. Community educators are worried that QQI awards are more relevant to courses designed to help people find jobs than to courses designed to promote citizenship and develop local leadership. Other concerns are that FETAC programmes are over-prescribed, over-assessed and that they don’t carry as much weight as courses from universities and institutes of technology, despite the high standards of work. community education. Vocational Education Committees (VECs) have been merged into Education & Training Boards (ETBs) and FAS has also been consumed within these structures, all of which is overseen by SOLAS, the new Further Education and Training Authority in Ireland. ETBs not only have responsibility for community education and training, they also look after primary and post-primary education meaning community education might not get much of a look in. Camilla has proven that community workers are anything but lazy. In another merger, FETAC and HETAC (its equivalent for higher education) and the accrediting wings of the universities have been replaced by a body called Quality and Qualifications Ireland (QQI). Its name will now appear on all awards. The 5 Rhythms® Movement Meditation Practice (MMP) offers us the opportunity to make all this movement mindful, to bring it into our awareness where we can learn to appreciate the uniqueness of our movement whether it is physical, emotional or mental. The 5 Rhythms® MMP is a physical way for us to ground ourselves in Flowing, centre ourselves in Staccato, release stresses and tensions from our bodies in Chaos, experience lightness of spirit and creative possibilities in Lyrical and to find the skills we require to be quiet and free in Stillness. They teach us how to move through our insecurity, selfconsciousness, and fear into wholehearted, positive, resilient and authentic beings. There is a dance only you can do, that exists only in you, here and now, always changing, always true, so do come and find it. 5 Rhythms® Movement Meditation Practice Movement is life and life is movement. This can be movement of our physical bodies, it can be thoughts moving across our minds or it can be the movement of feelings in and out of our hearts. For many of us this movement is mindless, a type of rote or sameness to our everyday life. Council. There is much speculation that, in time, everyone delivering FETAC courses will need to be registered with the council. This requires not only a primary degree but also a higher diploma in education/teaching. One wonders for the future of some of the fantastic community educators who have crafted their trade ‘on the job’ sharing their life experiences as they go. Pobal in late November held a national seminar to examine achievements and challenges under Goal 4 of the LCDP. The event included a presentation by Clodagh McDonnell, principal officer with the Community Division of the Department of the Environment, Community and Local Government. Instead of 114 local authorities, there will be 31 authorities at county or city borough level. She said, “The Department is taking forward a fundamental reform of the local government system. Our ambitious target has been that all of the changes we are making are in place or timed to have effect at the next local elections due in May 2014.” She said this will result in: - Nine rather than over 20 national agencies under the aegis of the Department, so that services are more easily delivered or functions are returned to local authorities; - The establishment of Irish Water; - The provision of over 30 shared services in local government to streamline “back-office” functions; - The local property tax system being put in place; - Efficiency savings and a reduction in local government staffing by 25%. Government’). “One year later, the detailed legislation to give effect to far reaching reform of structures, functions, funding, operational arrangements and local governance has begun its passage through Dáil Éireann. “The vision in ‘Putting People First’ sees local government play as wide a role as possible in public service – leading economic, social and community development - not limited to the specific areas which have traditionally been its main business focus, but also contributing to national recovery, economic growth and social development. “We are now moving to the next stage of strengthening and enhancing the alignment of local government and local development by putting in place a series of measures, based on recommendations from a dedicated and specialist Alignment Steering Group, established by the Minister in 2011. “The Alignment Steering Group published its final report in October 2012 alongside Putting People First,” she said. Where: Blackrock, County Dublin Fetac Award: Level 5 in Conflict Resolution 5NO692 W: www.totalfocus.ie E: b.walshe@ totalfocus.ie Tel. Barbara 086 8186639.
which will outline the State’s future engagement with those sectors.” “The LCDP will be the first Programme to be overseen by the LCDCs in each area. Funding of some €47.7 million has been provided for 2014 for the Programme”. Clodagh outlined issues highlighted in the Mid Term Review, namely the need to: - Focus on fewer outcomes; - Continue to engage with the most difficult to reach target groups (eg immigrants); - Focus on youth unemployment, especially for the harder to reach youth; - Contribute to citizen engagement; - Add value to public services by ensuring the progamme fills local gaps in provision and by preparing people suffering disadvantage to take up mainstream services. She said: “The Mid Term review of the Programme is being used to shape the LCDP’s successor programme, subject to DPER sanction following an economic appraisal of the Programme.” Meanwhile, transitional arrangements are in place for the LCDP for the first half of 2014. Programmes supported by Dept Through its Community Division, the Department funds and oversees the delivery of: - Local and Community Development Programme. - Rural Development Programme. - Seniors Alert Scheme. - RAPID Programme. - Scheme to Support National Organisations in the Community and Voluntary Sector. - Forum on Philanthropy and Fundraising. A key principle underlying the Department’s activities is enabling communities themselves to identify and address social and economic needs and problems in their own areas. There is a particular focus on supporting communities that are vulnerable, disadvantaged or under threat, and an adherence to the values of local participation. How’re we doing? The LCDP is ahead on priority work, behind in supporting some disadvantaged groups and facing crucial challenges because of cuts, rising poverty and re-structuring coming in 2014. poverty issues.” The report quoted Pobal figures which show the progamme directly supported over 7,000 people who were long-term unemployed to successfully apply for a job, or to set up a small business themselves. It specifically targets those who are most marginalised (eg older people, immigrants, exprisoners, low income families). The LCDP budget last year was €51m and Local Development Companies topped up their budgets by a further €99m with contributions from other Government, philanthropic and private sources. This funded a wide range of social inclusion projects at local level. However, the disproportionate focus on supporting long-term unemployed people means “there is a possible lack of attention in the Programme to other groupings suffering high levels of discrimination and exclusion.” “The figures would seem to suggest that the focus on unemployment is out of balance with other aspects of disadvantage,” the report said. a community development approach to issues. “It is a matter for national determination whether the prioritisation of unemployment will continue...” the report states. “Whatever the case, the LCDP framework needs to clearly support an equality focus and include the primary target groups.” In 2012, close to 50,000 unemployed people received support, well ahead of target, with over 6,000 of those finding employment. This in the same year that the Programme took a 15% hit to funding. The review was conducted on behalf of the Department of the Environment, Community and Local Government. It was written by Dr John Bamber in consultation with local groups across the country. The report highlights “significant issues” and calls for a renewed focus on the “outcomes” for people. These become evident in their learning and development. They can also be seen (and measured) in changes and improvements in their personal circumstances and in their social and physical environment. In 2012, the LCDP engaged with and supported 409,203 “Other Adults”, an increase of 35% on the previous year’s figure (265,868). (LDCs) which are managed by Pobal on behalf of the Department and 25 other groups were directly funded by the Department. The Programme budget allocation to the LDCs was €43,485m last year with an additional €6,618m going to the directly-funded groups. Now, a rethink on the programme’s goals is recommended. The Programme currently has 18 target groups and four goals (two of which get 80% of the resources) and critics have pointed to its weakness in promoting community development activities. CDP has exceeded its targets me tipping point” in terms of coping with cuts, year after year: “There have been and will continue to be redundancies, which results in the loss of skilled staff with knock-on consequences for frontline services. This is a particular problem for smaller providers,” the report noted. “Although (work) targets have consistently been exceeded, the downward trend in the budget is a major challenge for the LCDP.” The review recommended that to help cope with cuts the companies should be allowed focus “on fewer activities” concentrating on those deemed by local people to be most important so long as they’re in line with government priorities. “Concentrating a diminishing resource on what is most important would seem to be the most promising way forward,” the review stated. Community and enterprise workers employed through the LCDP, who put in long hours recording data on their work, may welcome (albeit in adverse circumstances) the report’s recommendation to reduce “planning, monitoring and reporting activity”. The data is described as “largely quantitative”. The report called for better monitoring but of fewer areas of activity, to concentrate particularly work that is collaborative, to work more with youths and to increase levels community engagement. This would reduce the bureaucratic “burden” on LDCs. Some companies are longer established than others and the report noted that LDCs’ performances vary and it called for “consistency” across the country and suggested that “critical feedback” could be provided to weaker performers. Companies that excel could be encouraged to share their work practices with weaker-performing companies. 2010-2013. This would include strategies for development with respect to education and employment, work with children, youth provision, and citizen engagement. • “Be accompanied by a communications strategy to ensure widespread understanding of the Programme’s role in achieving the government’s social inclusion objectives.” On alignment, the report said it remained to be seen how powerful the new SocioEconomic Committees at local authority level would be. The report suggested it would be wise to retain the LCDP’s “co-ordinating and developmental role”. - Opportunity remains to embrace citizen engagement and participative democracy Regarding a range of government initiatives, the report hails the emphasis on citizen engagement as most positive. It nonetheless calls for the term ‘citizen’ to be used in a broad sense to include the 12% of the population that are Irish. In reference to talks over the alignment of local and community development with local authority work, the report says the bottom up approach is central to the LCDP model, but “will require careful management” if it is to be retained. Comments in the report are directed chiefly towards the InterDepartmental Group led by DECLG that is currently devising a new policy for local and community development. “In enhancing the role of local authorities, it will be important not to sideline the skills of LCDP providers and (not) to undermine the bottomup approach,” it continues. the LCDP and there was “a risk in terms of how companies would be perceived” as and when they become more closely linked with local authorities. Some people in the Community and Voluntary Sector (as noted by ‘Changing Ireland’) already regard LDCs as quasi-state agencies. Despite their community bases and focus, the complete erosion of LDCs’ civil society status is possible, though there is equally the possibility that the opposite happens and LDCs’ role in community engagement deepens. It depends largely on how alignment goes. “Companies have been asked, for example, to share accommodation with their Local Government counterpart as a cost-saving measure. If this is done the public could start to view them as a state body. To minimise this risk, some Companies are using properties within housing estates that are situated within the community rather than formal offices. “Closer ties to local authorities could also mean that companies become overly bureaucratic, state dominated and identified as doing the state’s bidding. If this happens, they would be seen as outside of civil society.” The community engagement approach used by LDCs has evolved from years of experience. The report says: “In general, there will be a need to develop and support new and innovative ways for people and communities to participate in determining their own futures and that of their local communities and neighbourhoods, and in designing and controlling their public services.” It mentions examples, including citizen juries which can play a role in local planning and decision-making. As the report says on a number of occasions, “Engagement is central to sustainable change, and citizens should be ‘makers and shapers’ of policy and practice.” Citizens “should be involved throughout the cycle of planning” and LDCs “could assist the Socio-Economic Committee in terms of engagement and participation by providing a sustained infrastructure and support for citizens.” “Under instruction from the Department, however, Local Development Companies have given less attention to community engagement (Goal 4) than to education and training (Goal 2) or employment initiatives (Goal 3) since 2010. Some adjustment to current priorities may be required…” The report outlines the approach to citizen engagement taken by Scotland’s Community Planning Partnership. higher priority, closer attention also needs to be paid to the nature and quality of the work.” The report notes: “There will be a need to pay more attention to this area of work in response to Government policy imperatives concerning renewing democracy and citizen engagement, as outlined in the ‘Programme for Government’, and ‘Putting People First”. PROGRAMME HAS SEEN MORE REINCARNATIONS THAN ‘DR WHO’ What next for the Local and Community Development Programme? By Rob Carey The LCDP has had more reincarnations than Doctor Who. Indeed, its ancestry can be traced back at least as far as the 1980s and, as we await the latest programme design, it is timely to look at the current programme in light of the Mid-Term Review completed by the Centre For Effective Services. Let’s look at two of the programme’s three key approaches namely community development and social inclusion, which also covers poverty. (The third key approach is arguably partnership). The report suggests that all work conducted under the programme should be underpinned by a community development approach. There is sometimes confusion about this, with people saying that there is little community development in the programme. To understand it as an approach, it is useful to examine the balance of emphasis within the programme: The report questions how to balance responding to the social and economic dimensions of disadvantage. Up to now, there has been an-over emphasis on addressing unemployment directly, without adequately taking all the factors causing social exclusion into account. The social exclusion view captures the multidimensionality of disadvantage and describes how people are pushed to the margins due to their vulnerable position in society. For instance, issues such as gaps in the education system, one’s environment, mental health, family dynamics and substance misuse all impact on a person’s ability to fulfil their potential, contribute to their community and get a job. The many faces of Dr Who, currently enjoying a revival. the report. Active citizenship is like motherhood and apple pie (i.e. it’s hard to disagree with). But active citizenship takes time, skills, it must be participatory and have an embedded community approach. Otherwise, it is merely tokenistic and will mainly benefit those who already have the most social capital. In this scenario, while LDCs may record impressive statistics, they will not necessarily optimise their contribution to the community as a whole. The LCDP cannot be accused of being simple. At a rough count** there are 4 goals, 12 outcomes, 32 indicators and 10 objectives in the current framework. The report suggests less emphasis on indicators and more emphasis on outcomes. Many LDC workers would welcome this. The administrative pressure on LDCs who deliver a range of programmes is alluded to and I believe the following issues should be addressed: - The amount of paperwork involved in processing small amounts of money. - Inflexibility around expenditure (spending is not allowed for a range of items for which the rationale is not always clear). QUALITATIVE APPROACH The report calls for a more qualitative approach and seeks to capture learning. This would be very welcome and is something that was ironically more available in previous programmes such as the LDSIP when networking, case studies and qualitative feedback from Pobal were an integral part of the programme. Now, in the normal course of events, a company will not to be asked about the quality of the work by Pobal or by Departments, while finance and quantitative technical queries are the regular . In terms of the performance of LDCs there is a is a recognition that targets achieved show good performance against a background of a 41% reduction in funding since 2008. Overall, the report contains ideas which, if implemented, could see LDCs improve on that performance which would have a positive impact on communities. * Robert Carey is LCDP Manager with North and East Kerry Development. ** I didn’t spend too long checking in case I would have to log my time on the IRIS system and what would I log it under?! authorities, LCDP-funded companies and people in communities, so they’re able for the challenges ahead. · Communicate clear boundaries and realistic expectations about the place, role and function of community engagement in policy development, etc. · Support the representation and voice of citizens and community groups on the new Socio-Economic Committees (for example through reserved places for women and particular groupings). powerful weapon which you can use to change the world. 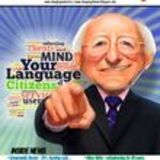 - Child-focused ‘chatter’ project is one of eleven nationwide BY ROBERT MCNAMARA April 2014 will mark the end of a remarkable project in Ballyfermot, Dublin 10, that taught 1,200 children better language and communication skills. Hundreds of parents, teachers, creche-workers and LCDP staff have also been taught how to continue delivering the work after the project winds up. The average three-year-old can for instance learn six new words a day, so long as the words are repeated nine times. With such knowledge, parents and teachers can guide little ones. However, as international research has found, young children’s abilities to communicate are below average in disadvantaged areas and Ireland is no different. The Ballyfermot initiative was one of 11 projects chosen nationwide under the National Early Years Access Initiative. Others included ‘Happy Talk’ led by Cork Partnership and ‘Start Right’ in Limerick (led by the PAUL Partnership). The Ballyfermot Chapelizod Partnership led a consortium that included seven primary schools, creches and playschools. Their ‘Chatter Matters’ encouraged parents in the Ballyfermot area to engage with their children for an hour a week in creches and schools where they played games and activities that boost communication and language skills. Tutors gave tips on how to improve speech and language skills to parents and children joined their parents then for various activities. ‘Chatter Matters’ is led on the ground by Tricia Curtis, a speech and language therapist with many years experience of similiar programmes in the UK and Ireland. She is currently working in seven schools and 15 other childcare facilities in Ballyfermot. As she says, you need to learn a language and you need a language to learn. “Ten per cent of children in pre-school present with speech and language difficulities,” says Tricia. “ It’s about giving kids a better start in life and if you can get their communication skills going, by the time they are five, they are ready for school.” Tricia also runs a ‘listening group’ with a smaller group of children which is designed to help them “to learn how to listen”. Natasha Brien and her son Tyler enjoying a ‘Chatter Matters’ session. him with his homework everyday,” says Darren. “At the start he was running around, but once he got into it and we sat him down at the table doing tasks, he started getting into it and enjoying it, he was able to sit down and focus on it,” he adds. Niamh Cooney, a manager at St Michael’s pre-school in Ballyfermot says parents, children and even staff are benefiting from the sessions. “The parents group have really bonded and the kids are really enjoying participating in group work and spending one-on-one time with their parents. We have learned new techniques and we use these in practice now.” Each of the eleven initiatives funded by the National Early Years Access Initiative differ slightly from each other. Some focused on language and speech, others on parenting skills and numeracy. They were all aimed at under-sixes. In Ballyfermot, while the funding for the current scheme finishes up in the Spring, much of the work has been completed while more will continue through the many adults who have been trained to deliver it. The Ballyfermot Chapelizod Partnership has in the meantime applied for funding from the Area-Based Child Poverty Funding Initiative to continue to support young children in the area. •	Children with speech and language impairments may develop social and behavioural problems later. •	High levels of speech, language and communication difficulties are found among prisoners. •	In a UK study, more than 72% of children who were impaired at age five remained impaired at age 12. •	Between 40% and 50% of children growing up in socially disadvantaged areas are starting school with delayed language skills. •	The cost to the taxpayer is significant if not addressed early. LCDP news briefs Dublin: 200 new women in business In 2012, Southside Partnership (SP) in Dublin supported 346 new business startups, apparently the highest number of new start-ups by any local development company in the country. This included 108 women. “This year so far, we have already supported 284 including 91 women and we anticipate that we will surpass last year’s figures,” said Marie Carroll of SP. The partnership is trying to improve the gender balance and a new initiative it is running is the ‘Steps To Success Programme’ for female business owners. The programme brings 25 female business-owners together – from driving instructors to children’s hairdressers - for training, networking and peer mentoring. It is funded by the Community Impact Fund and Ulster Bank. Meanwhile, in October, over 50 female entrepreneurs from Dun Laoghaire / Rathdown took part in SP’s fourth annual enterprise day. Over 50 businesswomen attended Southside Partnership’s ‘Women In Business’ event which took place on ‘National Women in Business Day’ on October 17th. The same date is also the UN-backed International Day for the Eradication of Poverty. ‘Keeping Safe’ leaflets in English, Romanian and Slovak were launched Pavee Point on November 21st. The leaflets were published as part of the international 16 Days of Action campaign to highlight violence against women. At the launch, community development worker Tessa Collins expressed her disappointment at the stereotyping of Traveller and Roma men. “I am fed up of Traveller men being stereotyped for domestic violence. Domestic violence happens in all classes and all communities. It is not more prevalent in Traveller and Roma communities,” she said. Blanchardstown Traveller Development Group (BTDG) was among groups nationwide that protested on November 25th at the failure of local authorities to deliver on Traveller-specific Accommodation. Protesters were complaining about “the lack of investment in Traveller-specific accommodation and the impact this is having on Traveller families and especially on Traveller children.” The Blanchardstown group highlighted the plight of the 14 families living on an unofficial halting site at Dunsink Lane. “Their site lacks basic services such as hot water, electricity and flushing toilets, bin collection,” said a BTDG spokesperson. “There is no postal service or suitable play area for children. The Local Authority in Fingal County Council has failed to provide accommodation for this family despite commitments made for the past 15 years.” Their protest took place outside the local authority’s offices. - Volunteers lead fray in fastest growing broadcasting sector One of the most exciting aspects of community radio is the fact that its ethos sees community radio as a tool for community development. By contrast, commercial companies view radio as a tool to make money. Many stations carry programming made by and for groups of local teenagers, migrant groups, active retirement groups, community councils, local history groups, disability action groups and so on. Local community development groups go on air to inform the wider community about their activities and events and to debate local issues. Through training up volunteers, stations work with diverse elements of society, from transition year school groups, to recovering drug addicts, migrant rights groups and those recovering from brain injuries. Community radio provides a means by which Simon Maher is the founder of two community radio stations, Phantom FM and 8Radio. Source: www.radionation.ie. individuals can gain personal development and fulfilment. People gain skills, grow in confidence, make PARTNERSHIP: This is the first in a regular series as ‘Changing Ireland’ and new friends and, often, the community radio station becomes an important Craol have begun collaborating to bring community sector news and views to a social hub where individuals and local organisations meet and share ideas and wider audience. support. So, listen out on your community radio station for discussions on some of the It is the community development ethos behind Community Radio that stories you read here. makes it different and contributes to its growth as Ireland’s fastest growing Both Craol and ‘Changing Ireland’ are based in County Limerick and broadcasting sector. community radio stations are welcome to contact us directly or via Craol. Challenging stereotypes Community radio stations explore and challenge aspects of life in their communities through innovative programming, such as Athlone Community Radio’s compelling investigation of the experience of asylum seekers in Athlone titled “Trauma, Tears and Hope”. They help challenge stereotypes such as Phoenix Fm’s marking of Traveller Pride Week with a series of radio shows recorded with Travellers in conjunction with the Blanchardstown Traveller Development Group. Irish community radio movement. Craol provides practical, day-to-day support and training for stations. The Craol Helpline (accessible by phone and email) handles everything from queries from station managers on governance, training and strategic planning to calls from the public who want to set up a station. part in accredited training in stations across the country. Several more courses will have been certified by year’s end. Craol co-ordinates the training and organises the annual Craol Féile where stations managers and volunteers from across the country meet to share knowledge and ideas. The training is accredited by QQI (formerly FETAC). At the wider level, the training and on air experience improves media literacy across communities, meaning they’re better able to speak up for themselves. To contact the Craol Helpline, phone 06391101. E: helpline@craol.ie. What makes community radio so different? From Bundoran to Youghal, Letterfrack to Dublin you can tune in to community radio. Immediately, the jingles sound different: “Our Community Radio Station” “Get Involved!” “Making a Difference to Our Community”. Community radio stations across the country are linked by a shared ethos and shared ideals. The voices on air differ from those you hear on commerical radio and you’ll hear presenters with strong local accents and immigrant tones. In a community radio station, young and old, of all abilities, backgrounds and interests volunteer with the station to make a difference in their community. A station’s most important role is to serve its community by: - representing the voices of that community, - by giving opportunities to people to volunteer and develop their skills, share their passions and contribute to their community’s sense of identity and togetherness. Programmes are produced and presented by local volunteers. Community radio, therefore, is a platform for local voices to be heard, for discussing ideas and news from the community, and for creativity and local talent to be encouraged and celebrated. 2,000 volunteers in 22 Stations nationwide Community radio stations are licensed by the Broadcasting Authority of Ireland, and must, by law, be not-for-profit, accountable to, and representative of the communities they serve. Every week over 2,000 Irish community radio volunteers engage with 307,000 listeners (Red C /GreyHeron survey) through 22 fully licensed stations and 30 other stations that are in development. The stations broadcast local news, current affairs, music, live performances, programmes on the arts, community development and inter-culturalism, local documentaries and original radio dramas. All the programming is produced by volunteers. More recent and ongoing decisions, typically justified in terms of ‘economic realities’, are effectively contributing to the dismantling of community development and social inclusion programmes. This movement towards abandonment of community development as an acknowledged approach to tackling social exclusion was in motion before economic collapse. In two ways, the austerity era has provided the context for a speeding-up of the demolition process. The first and most obvious trend is the ongoing erosion of the funding base: evident to every communitybased and voluntary project in the country, and even more apparent in the extent to which this is resulting in a deepening of exclusion and disconnection for members of already disadvantaged communities. Is community development on the ropes? terms of the numbers who ‘access’ services, who ‘participate’ or ‘complete’ programmes. As these become more valued, the other fundamental and significant benefits of community development become undervalued. Even if cuts and under-finding were not an issue, the second trend described above will contribute to increasing inequalities. Reviews of efforts to combat poverty in other countries have consistently shown that there is a supply and demand side to being effective. It is ironic, given the emphasis on everything economic, that the problem can be explained in marketing terms. Even when significant investments are made to supply and deliver community services, if there is not a corresponding effort made to stimulate demand (providing outreach to ensure access for those who are most in need of services and who are most removed from progression opportunities) then work towards tackling social inclusion fails. To be precise, concentrating resources on improving but centralising service delivery - without outreach - will result in more not less inequality. Why so? Those who are better equipped and more able to access improved services will do so; those who are not equipped or able will find themselves even more distant, disconnected, isolated and excluded. Brian Dillon is a community worker and researcher employed through the LCDP with Tipperary Rural Travellers Project. Contact the editor, Allen Meagher, today! Kindly email: editor@changingireland.ie Or phone 061-458011. Horace heads for Battersea... In 2014, unemployed young people across Europe will receive a ‘Youth Guarantee’. They’re all promised a course, a job or training within a few months of asking. Horace is not pleased. those who can’t find work and won’t take the boat. Except now the buggers have copped on that the government won’t tell them where all the courses are. Sure, they can’t, can they. There aren’t enough to go around. Give them time. 2014. Guaranteed. Mind you, this country is turning a corner. You can tell by the fact that we’re not all that bothered about having no electricity on Christmas Day. We don’t take any notice anymore when we see immigrants going through the rubbish outside our doors. Halloween isn’t so noisy anymore since the youngsters can’t afford to become seasonal pyromaniacs. And the motorways are quiet (outside the Pale). It’s a bloody great country in so many ways. If only the editor would give me a full-time job writing for the mag, but he says there’s not enough to go around and I’m too hard to reach. When? They won’t let me back into Ballybog CDP. Changed the locks. Going back to the civil service is a no-no, especially the Department of Foreign Affairs (say no more). The one thing I’m guaranteed to do is to keep battering away, to keep getting battered once in a while, to avoid a battering when I am out on the batter and in the new year I might just go to Battersea altogether. Might start writing for ‘Changing England’. don’t recycle that old computer yet	- Let us save you a few grand! By Owen Butler If you need to get more from your office computers, because you don’t have the budget for new computers or software, Owen Butler has some brilliant suggestions. He’s responsible for powering up ‘Changing Ireland’ and giving our computers – one a complete dinosaur - a new lease of life. He writes: It’s worth checking out whether a ‘tune up’ or ‘overhaul’ might do the trick. You might get the performance you need, at a fraction on the price of replacing your PC or Mac. ‘Changing Ireland’ invited me in to look at their computers, which would have cost over €1,000 (each) to replace. Instead of scrapping them, I was able to install extra RAM (Random Access Memory – the ‘processing memory’ of the computer) to speed up the computers and extend their working life. It cost about €50 to double the amount RAM on each of their computers and they ran noticeably faster. It doesn’t have to be like this. disk, and your backup is the actual old hard disk that you wont be using any more. Virus Scanners have come a long way, and the one that came from the shop with your computer may not necessarily be the best for your computer. If your computer is slow, consider replacing the current anti-virus programme with a new one. You can find many reviews of programmes on the internet. Talk to your IT guru or computer shop before making an informed decision. Remember two things – bigger isn’t necessarily better and be sure not to have two virus scanners installed at the same time. as Word, Excel, Powerpoint) and you have internet access, you could start using online software like “google docs” instead. The accounts are free, and have lots of advantages, your documents are stored online, not just on one machine, you can collaborate in real time with other people via the internet, and you don’t need to buy the software. This article was created on google docs without the need for installing office software on my computer. Another option would be to install free Open Source office software such as “Open Office”. For more, read my tips article on ‘Changing Ireland’s blog. Just type ‘Tech Tips’ into the search bar. Caution: Computers carry a risk of electrical shock and should only be worked on by trained professionals. development of the outreach programme to enable community reps to participate in outreach programmes provided locally by the university,” a spokesperson explained. Left to right Seamus McKenna, Mary Kavanagh, Frances McGee, Marie Reddin and Noel Breslin at NUIG graduation day. but never extinguished.” RIP NELSON MANDELA. Nicola Meade from Newcastlewest wouldn’t go shopping on her own two years ago. She wouldn’t dream of it. This January, she’s starting French classes. Full of confidence, the 37-year-old from Newcastlewest, Co. Limerick, is now helping others she meets on the ‘Towards Occupation’ programme to overcome their shyness. “I’d go over to that person, introduce myself, ask them did they want me to make them a cup of tea or coffee. I’d say that if they wanted I could sit with them in the group and they’d usually say ‘Yes’. I’d stay with shy people during the lunchbreak if they wanted.” “I used to be shy because, number one, I thought ‘God, I’m so stupid I could never do that course’. I was hiding away in my head thinking no-one could see me and I was afraid to talk to anybody. I suppose I was a bit paranoid.” “I’d never walk in anywhere on my own if there was a crowd, I’d have to have someone with me,” she said. Nicola is on disability allowance and has no work at the moment, but she’s starting new courses in January, in French, Irish, Maths and more. “I’m confident now. I’m great, I can chat away to people I don’t know. I’d never do that before.” “It’s a brilliant programme. The courses I’ve done have totally changed my life. “I see people in a group now who are like I used to be, with their head down and not making eye contact. They think like I used to that they can be invisible. “Two years ago, for the first time, I walked into a group I didn’t know on my own. Afterwards I phoned Finn (support worker), I was so proud. Next year, Nicola might go to France: “It would be nice,” she acknowledged. Above: Nicola Meade with classmates from the ‘Towards Occupation’ programme. Courses are tailor-made for the participants and cover everything from beauty and nutrition to confidence-building and much more.